Have wood projects on the go in your dollhouse. As you progress passed the exterior of your dollshouse... Beginning the room by room design is captivating to say the least. You will get to design, shop, build and explore the interior. Wood projects will greatly enhance your efforts here. One thing that can be said about all interior rooms: are that they are not as expensive or complicated to decorate as one of your real rooms in your own house. That said however, you should consider that each room needs the same kind of attention to design and artful display as one of your real rooms do. There are lots of wood projects to consider while decorating and furnishing a doll house living room. What period style is the furniture? What kind of curtains do you choose? How much detail do you go into? Think of it! What would you ideally want in your own living room? Wood projects can make them even more lifelike. So dream a little here and let your imagination go wild. your miniature design. The sky's the limit unless you just don't let yourself do what you want. Can your imagination picture a tiny toilet? What about toilet paper? Maybe you could even go so far as to have someone in the shower. All of these rooms are your own private little stage. So I encourage that creative spirit to come alive in you and really pursue wood projects in whatever furnishing you want to see. Never let a negative person rain on your parade. You will always feel better if you stick to what you want over what someone else says you need. The choices after all, in the end, are yours. Stay your course especially if you feel strongly about your desires. Thee perfect place to display miniature food choices. 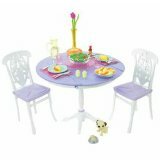 A dainty little family dining room fully set up ready for your dolls. So much to do with designing this tiny environment. It would be absolutely hard for any true crafter to become bored. Your miniature wood projects can be endless. And always new! Why if you did become temporarily uninterested in one area you could quickly move on to another and come back to the area you left unfinished when your creative processes surfaced again. Awe, what can you imagine for this room? You will need linens, curtains, small lamps, clothes, closets, and the ideas go on and on. This is a room where you can use where you live everyday to obtain many ideas. Is this bedroom tidy or is the doll you think of who lives there unkempt? Are they a slob? Oh now... I did say you could do what you wanted! Imagine a real shop with tiny tools. What supplies would you need to get realistic shop results? The above mentioned book has some ideas. Though this is truly a place where you will definitely need to use your own imagination. There may not be many tiny tools readily available for your workshop. In other words you may have to get creative and make your own. Making Dolls' House Furniture by Patricia King is another great book that will help. It is packed with imaginative ideas for you to explore. Patricia King does not particularly have ideas for a workshop, per say. However she does a lot of creations using everyday items to get extraordinary results. Using her book you can train yourself to be on the lookout for items that will facilitate the look you desire. All it really has to do is "look like" a saw or whatever. Right? Books one of my personal favorites. Stocking the shelves of this room would be one of personal desire and taste. What kind of books do you like to read? Stock the shelves of your bookcase with the books of your choice. Like I said above let your imagination go wild. These you can easily create with the help of Jim's Printable Minis to help you. What is going on in this tiny kitchen? Does it have maids? Is the butler on duty? Is the table set? Or is the table you feature here just for the help? Questions... questions... and they all need answers! 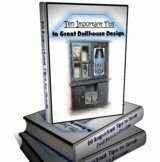 I encourage you to let your own ideas surface to make this the Dollshouse of your Dreams. One that you will show off to family and friends for years to come. 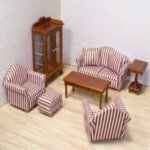 Purchase you own Wood Furnishings from our Toy Shoppe Store now!